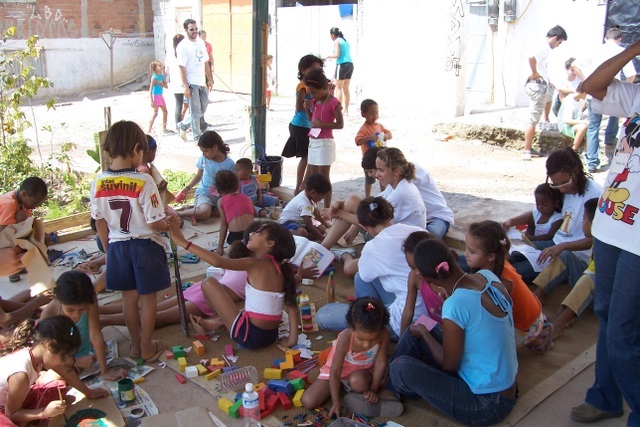 Ato Cidadão (Citizen Act) works with the Project Estação Atitude Cidadã in communities of São Paulo where children are especially at risk. Together they support the creation, organisation and consolidation of safe spaces for children, which provide access to quality care, games, leisure and social interaction. São Paulo is the largest city in South America and one of the largest in the world, and its social issues are on a matching scale – notably, a huge and growing difference in the quality of life between different social classes. Vulnerable and excluded populations are concentrated in peripheral areas of the city, distinguished by higher rates of deprivation and unemployment, as well as the highest rates of infant-child mortality. A culture of violence. The effects that a culture of violence has on ways of living, interacting and communicating can be defined as ‘indirect victimization’’. They include a fear of speaking about violent events outside the privacy of the home, and restraint in the use of public spaces. There are negative influences on contact between individuals, social cohesion, social capital and possibilities for collective action. Overlapping disadvantages. Comparative analysis of different population groups shows that inequality goes beyond just the economic condition. What little protection children have comes from their own community, and the fact that there is still a small measure of capacity for collective action in an environment of incivility and disrespect, shows that deprivation is due to the deficiency of the public authorities. The fight for survival. A phenomenon that affects the entire human being: the fight for survival. It dominates actions as well as feelings. It limits individuals’ prospects of growth and development and compromises their well-being. Beyond these three common factors, each community also has its own specific social risks. To be successful in creating safe spaces for children, we knew we must also consider the differences and variations between communities. We could not hope to transform communities by imposing a standard model. We needed participation of the community, including its children, in order for the project to ‘fit’ the profile and vision of each community. A great deal of work went into developing the participatory methodology used in this intervention. It’s important to remember how relatively recent and novel the principles of the democratic process are to Brazil. Our strategy has two parallel strands. Firstly, institutional engagement in order to promote public policies for children. This has two stages: engaging first with the various councils and institutions of the Rights Guarantee System (RGS) – primarily the Tutelary Council, which comprises five councilors elected by the population of each district, and is responsible for guaranteeing the rights and protection of children and adolescents; and then with other representatives from the area and with professionals from public schools. Parallel to these institutional actions, we carry out direct actions to allow people to experience first hand the positive effects on children of playing and socializing with each other. In public spaces such as squares and sports areas, many in precarious situations, we organise leisure activities – offering toys, entertainment and traditional games for the young and for their families. This practice helps the project to become universally accepted: even those who do not actively contribute tend to become supporters in some way. In our experience, proposing to create a space dedicated to playing always gets attention, positive feedback and support from all members of the population straight away or over time. Playing contributes towards socialization, family life and physical, cognitive and emotional development. Those who embrace these activities directly improve the quality of their lives. There is also a second stage to the project, involving technical training in leisure and recreation for members of the community. 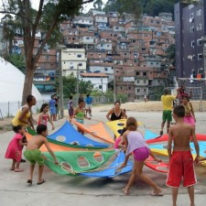 This not only strengthens each student, but also helps to promote family integration, optimise public and collective spaces, identify existing potential in the community, implement activities developed during the project, and encourage community members to value leisure and the culture of childhood. The importance of playing in appropriate environments is ever more significant in a society where children are pressured by expectations into assuming the roles of adults at an increasingly young age. We can see this happening when children prefer clothes and electronic objects to simple and collective toys and games, when children are more consumerist and status-conscious. Nowadays children generally play less than in the past; they don’t play as many street games, and they are no longer capable of producing their own toys. We also see this phenomenon in the increasing amount of restrictions to children’s playing environments, and the lack of spaces where children can be without having to share the space with an infinity of other things. For these reasons it is important to develop activities and spaces that promote spontaneous fun and games, offering the natural joy of freedom, involving children and helping them to grow. However, it is also necessary for playing to contain innovative elements, based on listening to the needs and expectations of the children. Child participation is fundamental in constructing such new concepts. It is also essential to involve adults in the development of the project, sensitize them to the children’s needs, and emphasize that enabling children to play games is a great way to contribute to their development. We therefore begin with a personal story from each participant – their memories of playing games, voices from the past that may give a new voice to today’s children. By the end, such a sensitized and involved adult – along with the team of the Citizen Act – is more likely to want to create spaces for children to grow in a healthy environment. Questions of survival. When adults’ attentions are focused on survival, it is harder for them to establish and maintain an identity that considers the needs of children. Public policies. Public authorities do not prioritise considering children as citizens with full rights, with special attention to their particular development needs. Nor is this one of the main aspirations of the community, which prioritises more immediate needs. Child participation. Many people are culturally conditioned to consider children as ‘small adults’, without any belief in children’s capacity and autonomy, and – including managers of public policies –without understanding their needs. Such people see only a need to keep children busy, rather than to allow them to exercise citizenship – including the right to occupy spaces and participate in public actions: a right that a child should have to the same extent as any other citizen. Social risks at a macro scale. 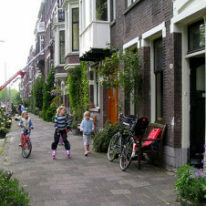 Severe situations that continuously affect children, in all the regions of the city to a greater or lesser intensity, include diverse types of exploitation and violence. Some of the most common are the use of drugs, exploitation and child labor, sexual abuse and aggression. The concept of full protection for children remains a novel one in Brazil, despite many initiatives to disseminate and spread ownership of this concept. But we believe it is necessary to do justice to the work of many people championing the rights of children.